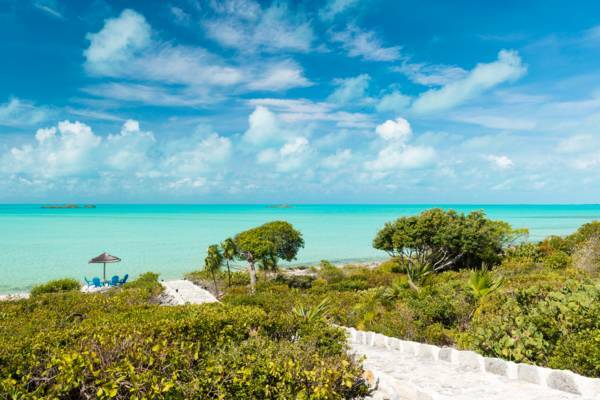 Sandy Shore Villa is a luxury beachfront villa surrounded by sparkling turquoise water on the beautiful island of Providenciales. 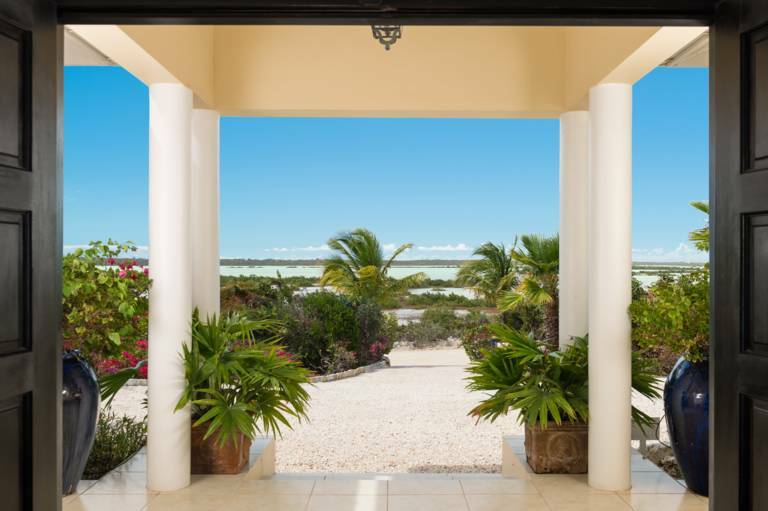 Nestled in serene Turtle Tail area of the island on the south side of Providenciales, Sandy Shore Villa offers complete privacy yet is barely a 10-minute drive to world-renowned Grace Bay Beach, and the restaurants and bars of Provo’s north shore. 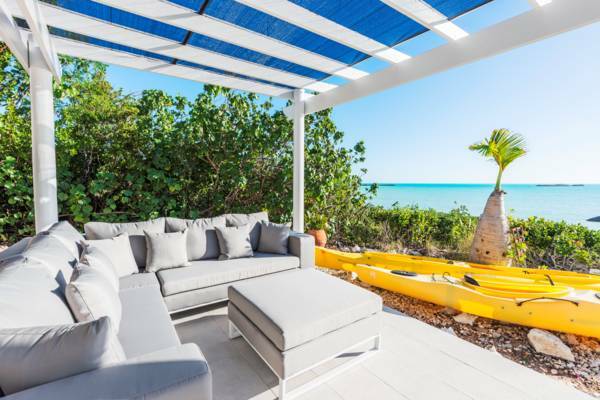 The custom-designed vacation home features 4 bedrooms, 5 bathrooms, a plunge pool, direct beach access, and stunning views of the shimmering Caribbean Sea and Juba Salina inlet. Sandy Shore Villa is surrounded by water on both sides, and its beachfront pool enjoys dramatic views of five uninhabited islands in the Caribbean Sea.Come experience the Caribbean vacation of a lifetime at Sandy Shore Villa, a perfect spot for a romantic getaway for two, families, or up to four couples. This property has a private swimming pool with built in lounge shelves for sitting and relaxing while immersed in the cooling water. There is also an outdoor shower for guest use. 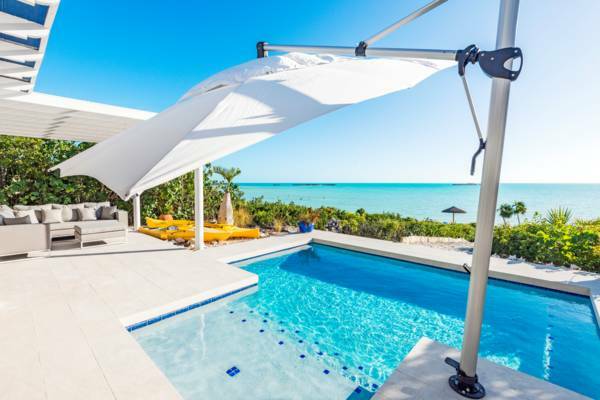 The Sandy Shore Villa swimming pool patio area is shaded by two covered pergolas, one to each side of the main living area. 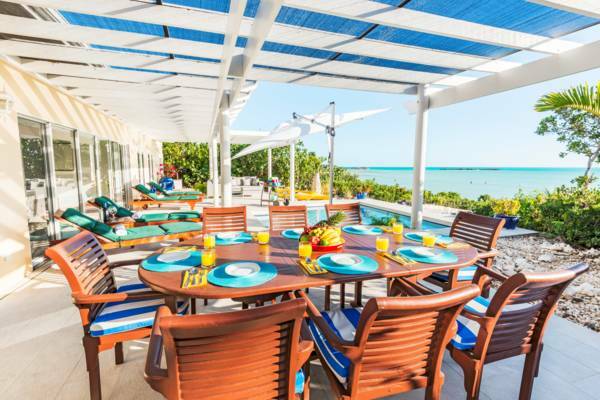 A large dining table on the pool terrace is absolutely ideal for informal, outdoor dining while on holiday. 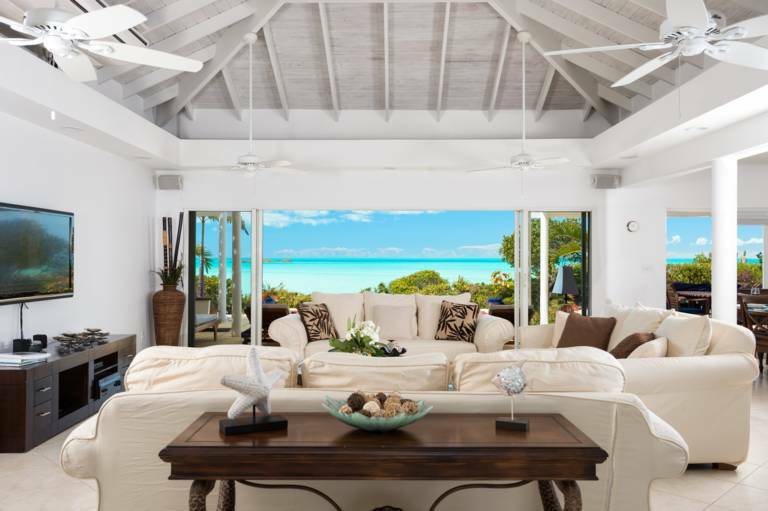 Sandy Shore Villa has a spacious, open-plan living and dining area. The architecture boasts seven 10-foot circular support columns and a two-story-high cupola with exposed beams. 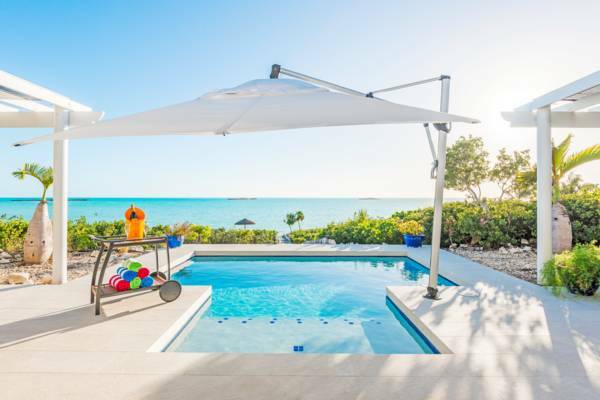 An 18-foot telescoping sliding-door system (with slide-away screens) overlooks the pool, the Caribbean Sea, and the nearby Five Little Cays. The villa has a surround sound stereo system in the living, dining, and kitchen areas, as well as on the pool/patio area. 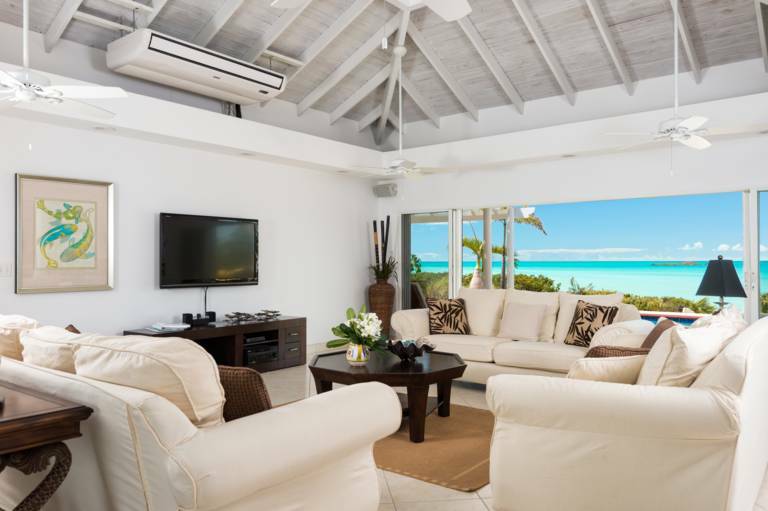 Sandy Shore Villa offers a full selection of entertainment equipment including satellite TV, VCR, DVD, and CD players. 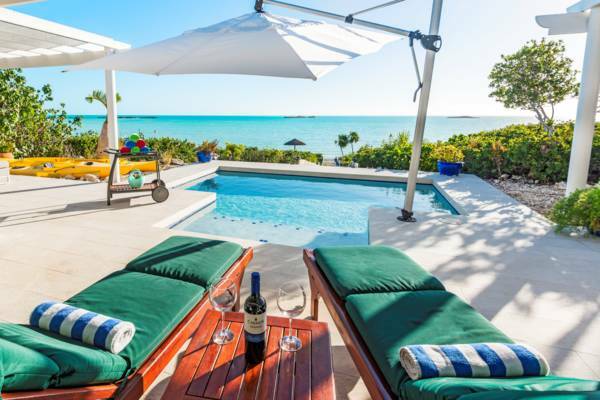 This vacation rental villa has a beautiful oceanfront master bedroom suite, with king-size four-poster bed and French doors opening to pool patio. The master bedroom also has a walk-in closet and his/her ensuite bathrooms; one with a jacuzzi tub overlooking the pool and the other with a large, tiled shower stall. Guest bedrooms are identical in size, each with a queen-size bed and private bathrooms. A private pathway leads from pool area down to the beach. 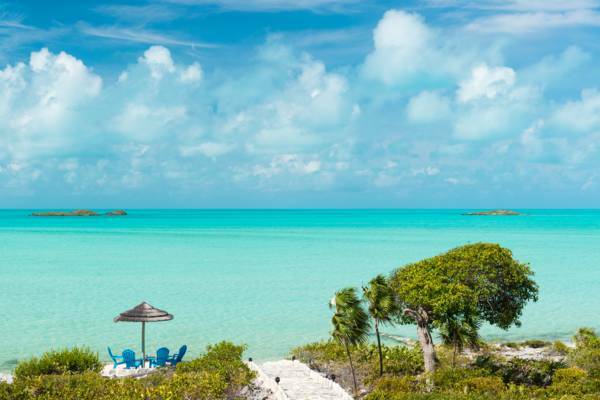 Enjoy a plunge in the shallow, warm waters of the Caribbean Sea, or a swim out to the Five Little Cays at the edge of the Caicos Bank, where lobster, conch, and a plethora of local fish await catching for dinner. 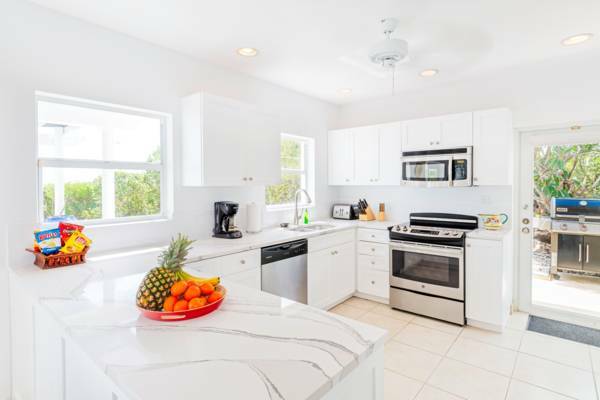 Sandy Shore Villa is not only cooled by the almost constant trade winds, but also has abundant ceiling fans and an individually zoned central air-conditioning system. Electricity is metered in order to discourage AC use with doors and windows open. 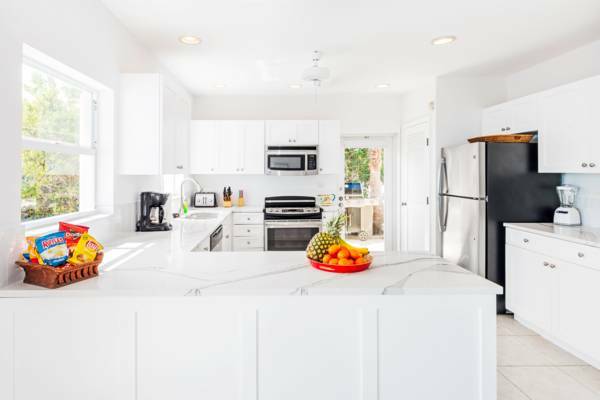 Guests are given the first $400 per week of electric cost at no charge, beyond that you will be charged actual costs. You will be shown the electric meter at check-in. Our family enjoyed every moment in this wonderful location! Grandson mastered swimming in the perfect pool for 3 year old children. 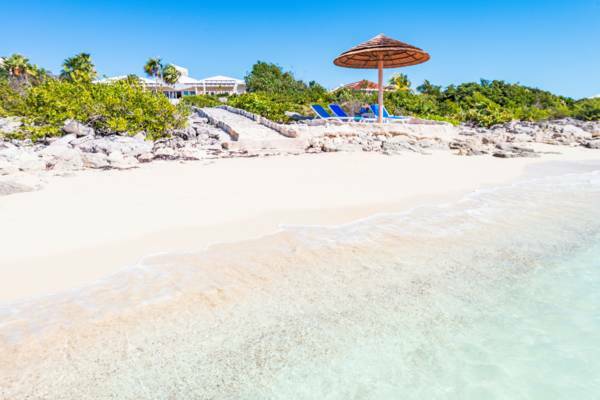 And the lounge at the beach, and the walks to the islands; and the kayaking; the beach walks and relaxation in perfectly placed villa with spectacular views. From the moment we walked into this beautiful villa and saw the stunning view, we all said ahhhhh! We're still here and soaking it all in. The home, the beach, the locals - warm and friendly and kind - the hundred of moments where we see one view more beautiful than the last. We hope and pray this island community recovers from Irma's wrath. We did meet a sweet cat called Princess but I'll leave that story to the girls Claire and Emily. It's their story and their Princess! 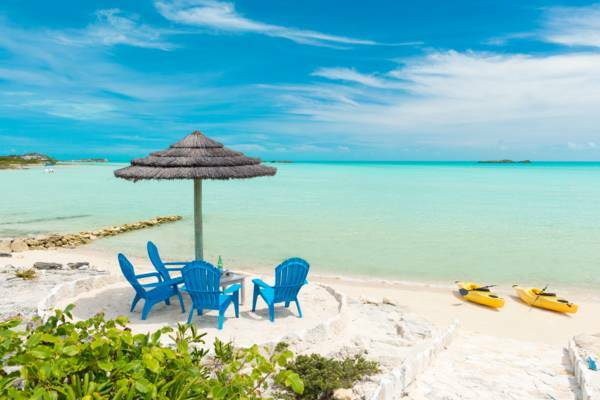 Our family of seven enjoyed our stay at Five Little Cays. Beautiful beach, the bluest water we have seen and very tranquil. My wife loved the early mornings sitting at the beach with her coffee and just enjoying the calmness of the water. The ocean is very shallow there, but our grand-kids, aged 10 and 12, loved being in the water looking for Conch shells and starfish. Floating on the rafts was another great way to enjoy the serene water and of course, there was the pool. Even though it was not large our grand-kids were in it a lot. We did make several trips over to Grace Bay on the other side of the island so they could enjoy the waves and body surfing. We also had a very friendly feral cat that greeted us every morning when we opened the sliding door and we were constantly amused by the curly-tailed lizards that darted around the rocks. 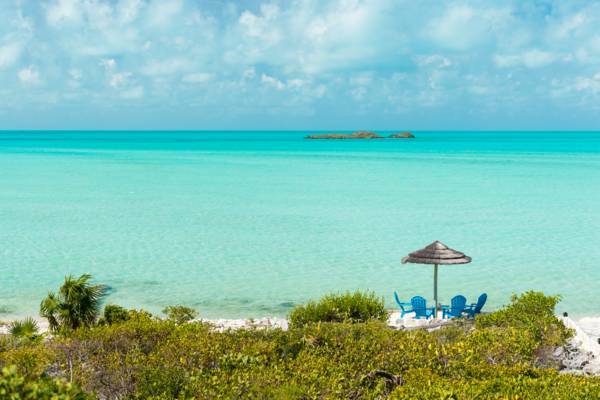 If someone is looking for a quiet side of the island, then I would not have any qualms recommending Five Little Cays.